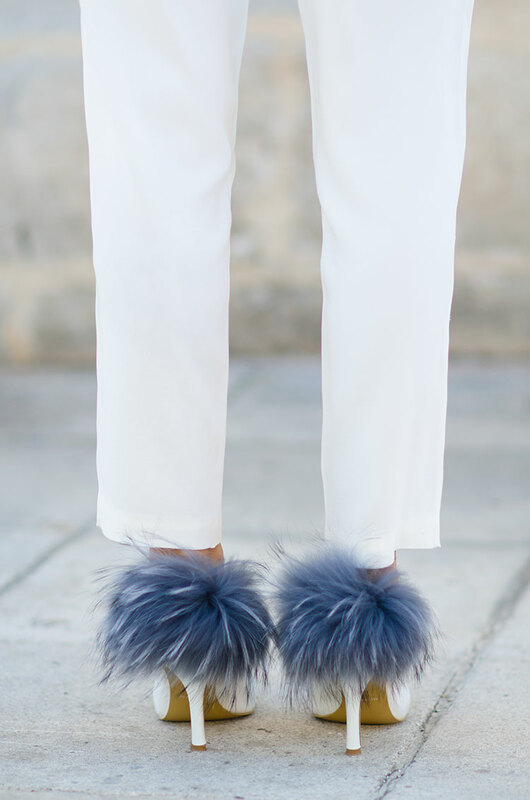 Candy colours and heels enhanced with little balls of fur. As far as I'm concerned that has to be the definition of an outfit capable of making your day. Yes, winter is here but the colour white is not likely to leave me anytime soon; I've been stocking up on white footwear and outerwear as much as ever. And while I knew Fleur du Mal to offer impeccable lingerie (you should know that if you are based in the States), I only recently realised its RTW collection is just as good (case in point). Now, I can't quite decide which is more of an eye candy: a pair of soft and puffy heels or a multi pastel tone Chanel bag (you can be the judge of that), but I do know that all the sweet references in this post are giving me a sugar rush! Have a good weekend! Wow amazing shoes and bag! Very elegant! The shoes give the cute and edgy detail to the outfit! Chic! Love the mellow colors for this time of year. Wow your bag is so gorgeous, the shoes are so fun too! such a sweet look, love the trousers and the top! when are you back in London? Hey Laura! Hopefully around mid-November! I'll let you know! I love the pastel colours in your outfit. The baby blues and pinks are gorgeous. Fabulous bag. You look gorgeous! Love the bag. It's like candy! I am loving the candy colored trend as well and look forward to incorporating them in my SS2014 collection. Love this look! The images are pristine, what camera do u use?? Hi Brandy! I'm using the Nikon D7000 with a fixed lens! What a great pics and information. Thank you so much for sharing this post. I really appreciate because there are only a very few people do such type of work what you are doing. By the way, where did you buy your sun glass from?